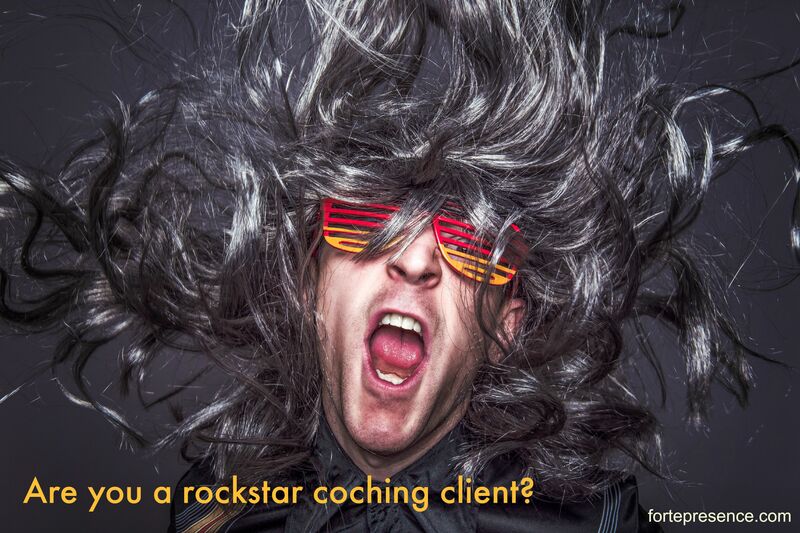 Are you a rockstar coaching client? Are you a rockstar coaching client? Who gets the most out of coaching? You might be thinking I’m talking about the coach here, because that’s the coach’s job. But it takes two to tango, and coaching is a dance for two (or more). I was coaching Steve today, and our interaction made me reflect that Steve is a rockstar coaching client. Steve (his real name, but not his real photo) is by no means the only brilliant coaching client I’ve ever had, but he reminds me of what I want to be like when I’m being coached. What are the qualities that make me want to be more like Steve? It can be tough to get feedback. In his job as an engineer, Steve expressed that could easily be lured into the mindset of ‘this has always worked for me in the past.’ I’ll have to ask him what drives him to be so open, but I know two things from being coached, and being a coach that make me aware of why being open to feedback helps. As a singer and dancer, feedback is part of the gig, and it can be tough. I know that when I’ve defended or explained why I was doing something the way I was, I lost the opportunity to learn more. When I started out with being coached, I felt that all feedback was personal. And some of the feedback was personal- and that tended to be the place I learned the most! The longer I was coached, the more I realised I could get out of my coaches if I let myself be guided. I still find it challenging, and nerve wracking, and frustrating to be coached. I also know that the discomfort I feel is part of the evidence that I’m being stretched, and these ‘growing pains’ will result in some new learning. I learned through post-graduate studies in education, that many people given feedback try to: justify, argue, defend, explain (JADE, educators love an acronym, here’s a related article). And it helped me understand my own behaviour as a student. It also made sense that when my students showed openness, and enthusiasm, that it was so much easier to give them more of the learning I had to offer. Their passion and commitment made me stretch to find other interesting things to engage them even more. Steve sees mistakes as learning experiences. He’s not afraid to lose face by doing something wrong. That means we get to put all of our energy into the next step of creating something even greater than our first draft. Enthusiasm is infectious, and positive emotions allow us to be more open to a creative process. With this positive approach, it’s easy to go into what researcher, Barbera Friederickson, calls ‘broaden and build’. Where we are open to new possibilities- our world is larger (including our visual as well as perceptual field). This broaden and build theory shows that in this state, we are more resilient, and better at academic performance. This also helps us see larger connections, which is evident in coaching Steve when he comments on how something he just learned builds on, and connects with all the other things we have worked on together. I love coaching someone like Steve, because it inspires me to greater creativity as a coach. Don’t get me wrong, some of my proudest coaching moments have come when someone who appeared very resistant to the entire process told me later that it had changed their life. But Steve teaches me how I want to be when I’m being coached. What new approach can you try to be more open to feedback this week? Body language’s most reliable indicator? 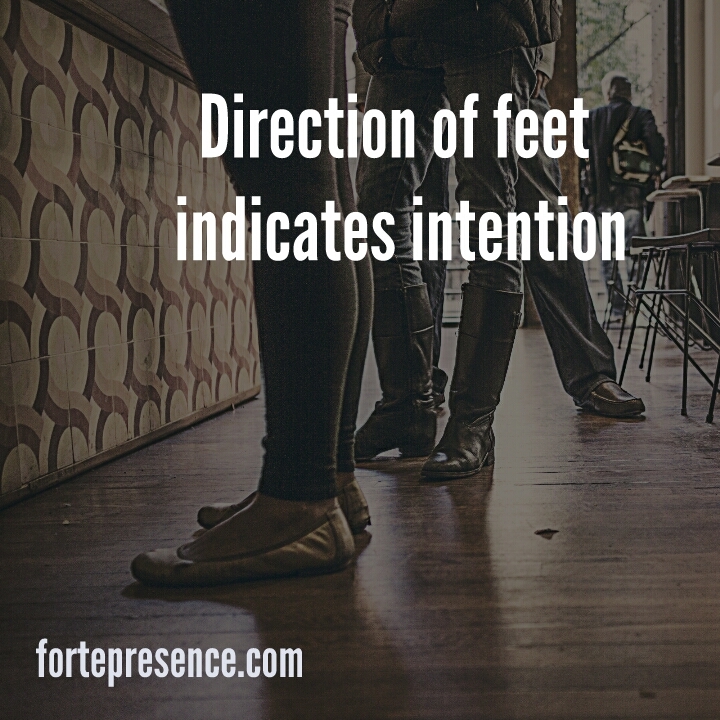 What is the most reliable indicator of intent in body language? It’s also the most overlooked; the feet. They lift up when we’re happy (gravity defying) and point in the direction we want to go. Do you feel like the person you are talking with might need to leave? Check their feet. If those toes are pointing towards the door, you can be fairly sure that’s where the rest of the body wants to go too. What kind of impression do give others? Does it leave a sweet or sour after-taste? What do people judge us on in the first three seconds of our first meeting? b) the coffee stain on our shirt, accompanied by that blob of Weet-Bix? Most of the information we communicate before we open our mouth is with our non-verbals. That includes our body-language, our posture and how we are dressed, and our grooming. How do we make a good impression? This can be summed up in one sentence: Think about the comfort of the other person. Make eye-contact, listen, check that your listener is engaged. When we get stuck in self-consciousness we forget to be conscious of others. ‘Zerafina, I’ve heard so much about you and have been looking forward to meeting you.’ Aww shucks. It’s nice to be noticed. When we meet someone for the first time, that snapshot is 100% of what we know about that person. Our tendency is to perceive that person bathed in the light of that ‘thin-slice’ of information. If we serve up a bitter-lemon thin slice, others will perceive us to be the whole lemon. All of our subsequent actions will be judged in light of this information. This would be the ‘horns’-effect. There are plenty of other things we could add to this list. Often we do some or all of them assuming that others will know that we are just having an ‘off-day.’ But that’s the sum total of everything a new person knows about us. Find ways to demonstrate those things. Last of all- check your shirt for coffee and Weet-Bix. It’s easier to be forgiven for the coffee stain than making others feel uncomfortable, but it helps to look like we’ve made an effort with our appearance. 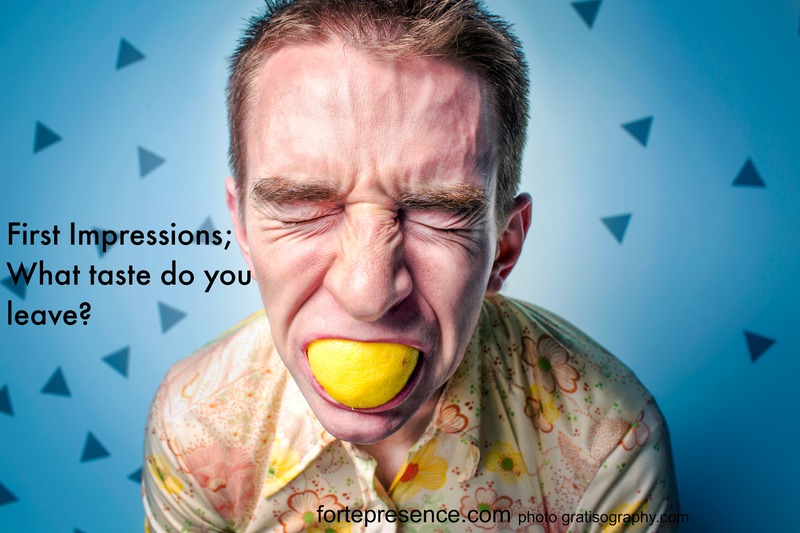 What can you do this week to improve the first-impression you give?